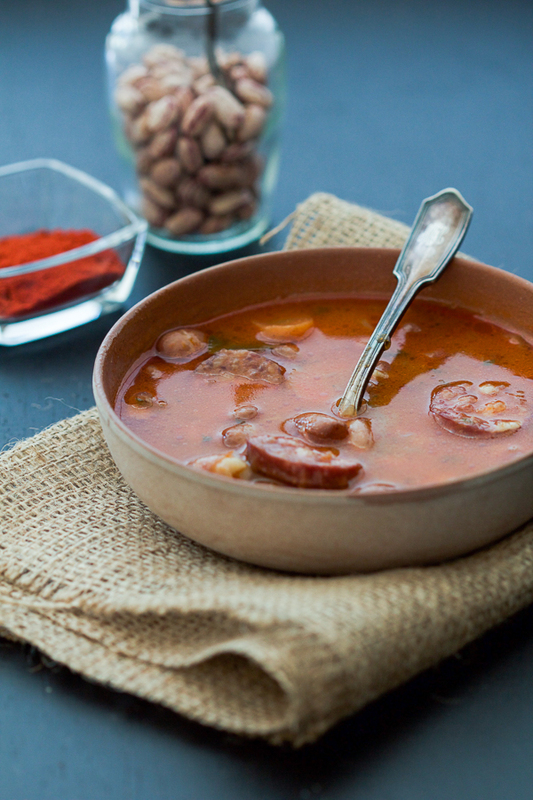 Balkan bean stew with kielbasa: a perfect hearty stew for these unstable spring days. Quickest version yet. No roux. And no wait for the beans to soak. Just a quick boil and they’re ready for cooking. Easily a GLUTEN-FREE option. 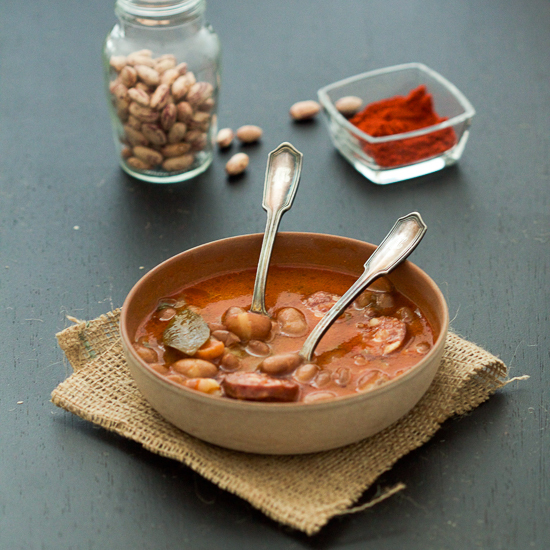 Grah or pasulj, or the bean stew, is a staple meal in the Balkans. All of us go through a grah graduation of sorts. We like it as children. Hate it as teenagers and young adults. At maturity, we finally come to a place of understanding that grah is as Balkan as the pita itself. There are different variations. Here is the one with kielbasa. As always, if making it for someone from the area, check whether they eat pork. If not, use a chicken kielbasa. Variations: use a gluten-free kielbasa for a gluten-free meal. 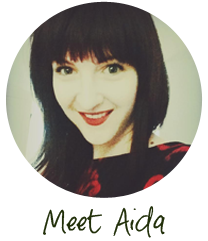 A story authored by Samir Hajdarević, about YNA, Samir’s father, and the memories found in a box. Also, today’s version is an adaptation of Samir’s bean stew. I was sorting through the cardboard boxes in the basement, which for a long time served as a home for unneeded objects that dragged around the house. I needed more space for new things that were presently in the way. Opening one box after another, to get familiar with the contents of each and decide what I could get rid of for good, I came across a few old photo albums. Very old photo albums. They don’t make these anymore. One had a wooden cover, and Zagreb cathedral carved on the front, while the inside pages were made out of a thicker, dark paper, where each page was enveloped with a see-through plastic covering so that the photographs would not be damaged. The second one looked like the first one, a long rectangle bound on the short edge. Front and back were embroidered with colorful threads. In effect, the threads combined two opposite ends and formed colorful squares. It looked like a mosaic, and if exposed to the light, it glowed. The third did not even look like a photo album, it was more like a box for photos. Unusual. Shaped like a book. Massive. With the same colorful squares made of threads, filled to the brink with photographs. All photographs were black and white, with a white, wavy frame around the edges. Mostly faded, some yellowed, they showed young faces, to me foreign even though they belonged to my father. Inside one of the albums in big, printed letters it said: 16 APRIL 1968 – MEMORIES FROM THE YNA. YNA (Yugoslav National Army) were the armed forces originating from the winning, liberation WWII Army (which we like to call the Partizans), and it was one of the pillars of (then) socio-political order. It counted for being one of the most well-armed armies in the world. Which isn’t at all strange taking into the account politics of the non-aligned movement and the balancing act of building good relations with everyone in the yesterday’s world of blocks and deep divisions. For regular people however, it played a different role. There existed a one-year military service required of all healthy, adult men, often experienced as a type of maturity exam. Like growing up, this was a unique transition from the carefree boyhood into the time of maturity. Going away to army parties were accompanied with pompous celebrations with family and friends. A step into the world of the grownups. It was all probably a bit much looking from today’s distance, but every period of time has its own customs even if not well-understood sometimes. And a characteristic of new generations is that they look at the times and customs that came before them with misunderstanding, and sometimes even with disdainful wonder. Flipping thru further, I stopped at yet another. It showed a group of some twenty young men, hugging in two rows in a very nonchalant way, so that the ones from the top row almost laid over the ones below, hugging them tightly or “fake choking” them with different grimaces and gesticulations, clearly showing the kind of rapport of people who developed a high level of closeness and want to demonstrate it. The photograph was taken at the long and wide row of tables, probably in the cafeteria. Out of many legendary stories connected with the army one definitely is connected with their cuisine. Especially the army bean stew. Some claim that it owes its inimitable taste to the cooking in the large army pots, and that the cooking in such quantities is what it gives it that special aroma. The secret of its preparation has never been completely discovered. And a number of generations schooled by the army are witnesses to these claims. Army service has not been in existence for a while now, and a number of new generations including my own doesn’t have this sort of experience stored in us. And I am very curious about the secret of this army bean stew. I promised myself I’d discover it eventually. According to a post making rounds on FB, the Yugoslav National Army’s famous bean soup secret recipe has finally been revealed. We did a vegetarian version of it, and called it BEAN STEW. Although not a stew or a soup, soft and moist BAKED ROMANO BEANS will leave you breathless, and we promise they’re the most perfect side dish on Balkan Lunch Box. We’ve also explored Macedonian baked beans in a pan. We’ve got a fast version for you called TAVČE GRAVČE, as a well as a more traditional version you can find here: GRAVČE NA TAVČE (BEANS IN A PAN). 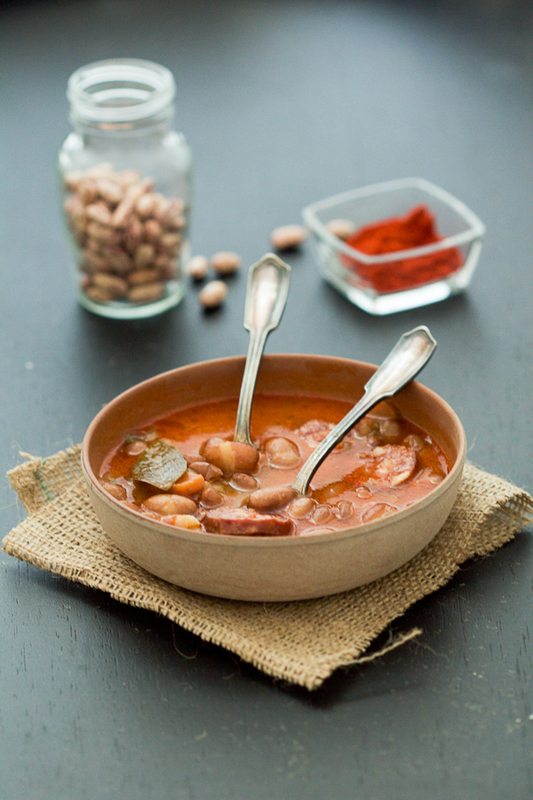 Our favorite bean stew recipe though, is the CLASSIC BALKAN BEAN SOUP/ STEW. Are we blowing your mind yet? Happy cooking! In a deep pot, cover beans with water and bring to boil on high. Lower to medium and boil for 5 minutes. Strain, wash well, and discard the water. Set aside. In a pressure cooker* heat butter on low to medium. Add onion, garlic and carrot and simmer, stirring frequently. Add kielbasa and stir again. Add seasonings and continue stirring. Fill up the pot with 4-5 cups of water. Add beans and close the pressure cooker. After the first steam, cook beans for about 20 minutes (or use the stew setting on your pressure cooker). 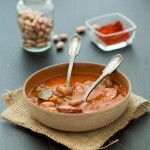 Eat bean stew for late lunch or early dinner. It gets better after a day or two in the fridge. Skip eating it in late afternoons or evenings as it can be heavy for the digestive system at night. *If using a regular pot, cooking time will be longer. The beans are done when they’re soft, but not falling apart, about 60-90 min. Gluten-free: use gluten-free kielbasa and bouillon cube. Vegeta is gluten-free. Low-carb: use a low-carb kielbasa. can I use canned beans instead? I don’t have a pressure cooker, could I still use a regular pot? You can use a regular pot but cook the beans a longer period of time, about 60-90 minutes. You can check to see whether it’s done by testing the beans – they’ll soften when the stew is done. I’ve never used canned beans. Dry ones that have been soaked beforehand are generally better. They take longer to cook, so the flavors of the kielbasa and beans really come together. If you use canned beans it won’t take as long to cook, but the taste might not be as deep and flavorful.